A CNA’s job is extremely challenging and fulfilling. CNAs provide important emotional and social support at a time when patients need it most. They are a critical link between patients and other healthcare professionals on the patient care team. 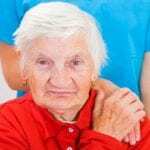 Serving on the front lines of healthcare, they are often the principal caregivers for residents in long-term care facilities. According to the Bureau of Labor Statistics, CNAs make an average yearly salary of $24,500, but salaries can be as low as $17,955 or as high as $31,225, depending on education, experience, and place of employment. Job prospects for CNAs are expected to be positive due to the increasing long-term care needs of the aging population. The majority of opportunities are available in assisted living facilities, nursing homes, and private homes. Individuals looking to become a part of today’s healthcare industry can complete the nursing assistant program in just 6 weeks for immediate employment. Graduates are eligible to take the state nurse aide competency exam for placement on the nurse aide registry. Instructors use classroom theory and practical clinical experiences to help students develop the skills that are essential to safe and competent patient care. Coursework includes basic patient care, fundamentals of nursing, anatomy and physiology, medical terminology, legal and ethical responsibilities, preventative care, personal hygiene, feeding and nutrition, infection control, and transferring patients. 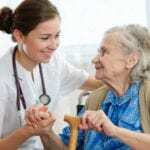 During the clinical experience at a long-term care facilities, students provide direct patient care under the direction of a licensed nurse instructor. The combined classroom and clinical instruction total 175 hours. Successful graduates are prepared for taking up entry level positions in nursing homes, hospitals, and other healthcare facilities. The four-month nursing assistant program at the Columbia Area Career Center includes classroom instruction plus more than 100 hours of clinical experience in a skilled nursing facility. The program includes instruction in nutrition, anatomy and physiology, basic nursing skills, infection control, mental health, personal hygiene, emergency response, and communication. The clinical experience affords students a large amount of hands-on experience in real-world settings. Classes meet Tuesday and Thursday evenings from 5:00 pm to 9:00 pm. Successful graduates will receive a certificate that will make them eligible to take the nurse aide competency exam to become certified. Applicants must complete the application accurately, take the NCRC admission test, register with the Family Care Safety Registry, obtain a clean drug screen, submit a letter of intent and letter of personal recommendation, provide documentation of negative TB test, pay the application fee, and provide a copy of their driver’s license and social security card. In accordance with the Missouri Department of Health and Senior Service requirements, students must attend all 75 classroom hours and 100 clinical hours. The cost of tuition and the textbook is $999. The tuition is payable in three payments. Students must budget for additional costs for the application fee, CNA certification, uniform, and admission test. Job Point offers nursing assistant training to persons seeking employment assistant. The program is especially targeted to individuals who are unemployed or underemployed, persons with physical or mental health conditions, adults and students with disabilities, and youths over 17 years. The fast-track training includes 175 contact hours of classroom and clinical instruction that students complete in 6 to 8 weeks. The hands-on clinical experiences begin in the first week of class. Applicants must be 18 years or older, pass a background check, obtain a clean drug screen and negative TB test or chest x-ray, possess a high school diploma or GED, read at an 8-9th-grade level, and be physically capable of performing the duties of a CNA. Graduates are eligible to take the state certification exam for employment in hospitals, residential care facilities, home care agencies, assisted living centers, and skilled nursing facilities. Moberly Area Community College facilitates a Certified Nursing Assistant program that prepares students for employment in a long-term care facility, hospital, home health agency, or doctor’s office. Instructors teach skills in resident care which will make students qualified to perform basic nursing procedures under the direction of a licensed practical nurse or registered nurse. The curriculum consists of 100 hours of supervised clinical practice plus 80 hours of instruction in a classroom setting. Students meet for twenty sessions in the classroom and learn the ethical principles governing practical, measuring vital signs, safety and emergency procedures, medical terminology, anatomy and physiology, infection control, and fundamentals of nursing. The program cost is $900 plus expenses for books and clinical supplies.